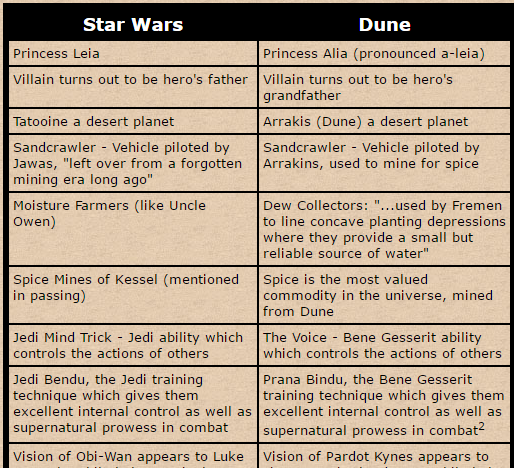 Of course Jakku is a Dune/Arakis like planet that used to be lush, green with water.... And now with the spoilers from Aftermath we know that Jakku is a really important place that the Palpatine has prophesied about like the Bene Gesserit prophesied about Arakis. @spacebaby45678 - Nah, it's a callback to Brewmaster Smith! @snufkin wrote: @spacebaby45678 - Nah, it's a callback to Brewmaster Smith! 6. BOB AND DOUG LOVED STAR WARS, BUT THEY MISSED SOMETHING IN PLAIN SIGHT. 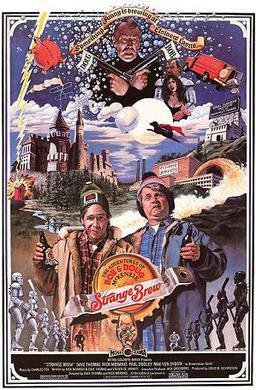 At the beginning of the hockey game scene where Bob and Doug find themselves in the middle of Brewmeister Smith (Max von Sydow) and his minion controlling the minds of the asylum patients via random notes on a keyboard, the brothers make a joke referencing Star Wars. “I am your father, Luke. Give in to the dark side of the force, you knob,” Doug says, decked out in hockey pads that resemble Stormtroopers from the galaxy far, far away. “He saw Jedi 17 times, eh,” Bob says to Elsinore Brewery employee Jean "Rosie" LeRose, who also takes part in the game. What Bob and Doug don’t know is that Angus MacInnes, the actor who plays Rosie, played Gold Leader, one of the Rebel Alliance Y-Wing pilots who died during the attack on the Death Star in the original Star Wars. .
@vaderito wrote: I honestly think that, if they take Renperor route, they could surprise all and make him a brilliant ruler. Everyone would expect Palp 2.0 but that's a waste. Galaxy is huge and Republic concept obviously cannot hold all planets in order because too much time is wasted on bickering and idleness. Bloodline covers that in detail, TP also showed us glimpses of it. So ruling has to be centralized to a degree to provide efficiency of decision making. And as pointed out several times, in TP and Bloodline, an Emperor figure who is not like Palpatine could be the solution. I agree with you about Kylo. I don't think he's incompetent at all when he's not having an emotional meltdown. Not that these are great examples because he's evil then, but he was a lot more competent in his mission on Jakku than Hux was. Hux sent two guys and two fighters. Even the local police send 10 officers when they are trying to arrest somebody. If Kylo can pull himself together emotionally, which means accepting his dark/light self and stop the self-hating and confusion, I think he would be fine. His parents were natural leaders and intelligent, why not him? He just has his emotional/force baggage to get over that they didn't have. Ye, Kylo's big problem is that he hates himself. If he finally gets to realise that being vulnerable isn't being weak, being strong doesn't mean being ruthless, and that having his own parents afraid of his powers wasn't his fault he could be fine. Which is where Rey comes in. You know my favourite thing about TPM was probably Padme giving the Republic a big giant 'f**** you'' and saving her planet by herself and the help of her people.If she had let Naboo's faith in the hands of the Republic Palpatine would have won and the Republic would most likely have been destroyed much earlier than it did.So if Kylo teakes after his grandma(who the people wanted her to rule them for the rest of her life)he would be a brilliant ruler. Well, at this point it doesn't really matter whether he'd have the qualities of a brilliant leader when his mental health is restored. If that description of Leia's unborn child in Life Debt is anything to go by - with its pluck and wit and blood of steel - Ben Solo in his optimal state probably would have been a good leader, much like his mother. But what happened, happened. If this were real-life Mediaeval history or something like GOT, he could get away with killing his father and then rule a flourishing kingdom for 40 years. I seriously doubt this would happen in Star Wars, though. And while I'm sure SW will always have individual monarchic planets, some with good monarchs, I can't imagine SW ever showing a galaxy-wide monarchy/dictatorship in a positive light. Not even as a "necessary evil in times that require a strong central ruler" or whatever. And while I can see that the novels are going for a more grey approach, (a) that greyness wasn't present in TFA at all, and (b) just because both sides have some better people, some worse people, and a lot of ordinary people working for them, that doesn't mean that a totalitarian regime in itself can be a good thing. It just means that the Republic/Rebels/Resistance don't always live up to their ideals and should be more self-critical, and that democracy has its weaknesses. I think even the prequel trilogy showed that democracy has its weaknesses. Even Padmé saw it. She didn't stop believing in it, though. But I think I've said all this before... sorry for being repetitive. @Darth Dingbat wrote: Well, at this point it doesn't really matter whether he'd have the qualities of a brilliant leader when his mental health is restored. If that description of Leia's unborn child in Life Debt is anything to go by - with its pluck and wit and blood of steel - Ben Solo in his optimal state probably would have been a good leader, much like his mother. I see where you're coming from but we really don't know LF/Disney's plans for the next movies after episode 9 because I'm pretty sure they'll continue making them so I can see them exploring the idea of another Empire in the future because we've seen the Old Republic,the New Republic,hell we may evens ee New Republic number two but we've never seen whether the concept of Empire would work better under a different ruler.It also doesnt have to be a totalitarian rule it could be like the British Empire nowadays in RL. Sorry,I don't mean to be repetative either I'm just theorizing at this point what concept SW team would like to explore. Yeah, but the EU has explored a lot of things that don't really fit in with the tone of the episodic films. 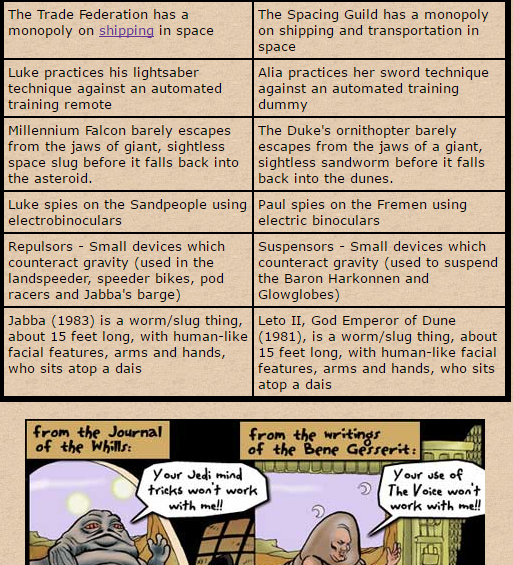 Even now, TFA and the canon novels, comics and so on seem to depict rather different versions of the same universe. But I guess we'll see. Of course there's room in the GFFA for a saga of politics and power struggle; I'm just kind of assuming that this trilogy still follows the mythical model, not least because Kylo's own struggle is on such a mythical level. Yeah, SW is first ever Republican fairytale. They are always monarchist as is fantasy genre in general, but SW replaced monarchy with the Republic which is very American thing to do. I'm neutral on the whole Renperor thing but it's fun speculating. 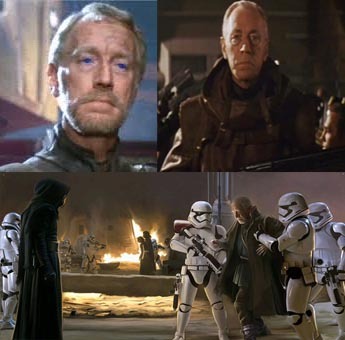 However the whole idea of a better Empire under a different Emperor was presented in Boodline(which RJ was involved in) byt Ransolm Castefo(a character presented by LF) so it could be an idea they want to explore in the future even if it's not in this trilogy(plus originally Kasdan and Kurtz wanted an ending for RTJ that had Leia become Queen),but like you said we'll se what they have in store for us. @vaderito wrote: Yeah, SW is first ever Republican fairytale. They are always monarchist as is fantasy genre in general, but SW replaced monarchy with the Republic which is very American thing to do. I think SW has always been a bit of a having-your-cake-and-eating-it-too... I mean, the ideals are very republican, but you also get the mystique of princesses and queens. I just feel like there's a huge difference between being the rightful Queen of Planet X (fairytale princess) or the Galactic Emperor (fairytale ogre, stand-in for all oppressive and expansionist regimes in history, ultimate Dark Side #lifegoals). Hahaha,if Rey's a decendant from a DS family chances are that she's the rightfull Empress of the FO if that DS family comes from Palpatine's line. Btw,I think it was GL's son who comapred Rey to Anastaisa from the movie with the same name which was based on the myth that one of the daughters of the last Emperor of Russia survived after her family was brutally murdered. Ransolm really did put a more nuanced spin on the Empire. OTOH, Aftermath: Life Debt makes a lot of the Empire look *really* bad. The Wookie planet stuff is unbelievably terrible. However, at the same time, the Republic government in Bloodline is a complete cluster and way too decentralized. i keep thinking "where is your Alexander Hamilton or Abraham Lincoln" in there? For those who are not American, just insert your political figure who centralized the government enough that it was functional, but still gave its constituent parts some freedom. In other words, with so many different planets, they need to federalize smartly. Either that or have a "cake and eat it too" option (thanks @Darth Dingbat) where they have a constitutional monarchy of some kind. The centralization could go with the King/Queen, but there would be real representatives, and the monarch would have a significant check. Either that or have the concept of the Republic/Constitution itself be like a kind of a civic religion like the Roman Republic itself. None of these solutions are perfect obviously. The Roman Republic fell to the Empire, the American government has gridlock and so on ... but what they set up in Bloodline is just not functional. At the same time, the Empire in Life Debt just plain disgusting in some ways. There has to be a middle road. It's like an analogy to the balance of the force. You need order and freedom. They will always play tug-of-war, but the goal should be to the reach the balance. Oh yeah,deffinatly.I think they could create something more stable and powerful if they tried to reach some sortof a middle road.The probelm is that each side sees themselvesas the right one and they're unwilling to compromise which does more harm than good to the Galaxy. I think the new books are painting two kind of Imperials the ones who are ruthless monsters(The Grand Moff on Kashyyk is a great example of that)and those who live in denial about what the Empire truly was and/or want to make it better(Sloane,Cienna Ree,etc.) just like there are different portryals of the Rebellion/New Republic like Mon Mothma who wants to save the planets who'll be usefl to the New Republic and Leia who takes a more idealistic approach(and has aVader moment there,lol). And doesn't Galluis Rax want to make a new more powerful Empire and is calling himself an Emperor? It can't happen. The world isn't ready for badassery on that scale, it'd be like Wesker and Jill in Resident Evil 5 - pure constant epicness. 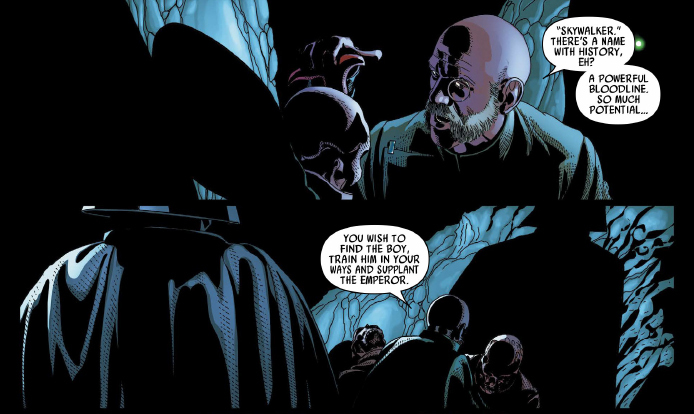 I read something in a recent comic which makes me wonder whether they're planning to explore more of the history of the Skywalkers....even before Shmi....... and if they are going with this angle, I won't be surprised if they go the route of Renperor. My Dune was not complete tongue in cheek. Bloodlines are of the uptmost importance in Dune, in fact it is the Bene Gesserit that control them, who marries who, who births who. The Breeding Program was a long-term project developed by the Bene Gesserit Sisterhood whereby certain genetic stock was purposefully bred. For more than 10,000 Standard Years the Bene Gesserit had manipulated bloodlines to produce the Kwisatz Haderach, essentially a male Bene Gesserit who could possess Other Memories as well as see into the future. We get your inspiration George!